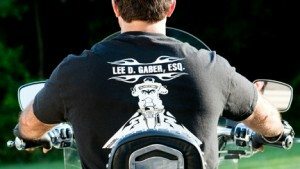 My motorcycle accident law firm, the Law office of Lee D.Gaber, Esquire, only represents the victims of motorcycle accidents! We have never worked on behalf of any insurance company, nor do we ever intend to. Our focus has always been on you, the injured party and it always will be! My law firm is located in Conshohocken, Pennsylvania since 2008. My proximity to the Turnpike, Blue Route and the Expressway allows me to meet with motorcycle accident personal injury clients in person, usually within 60-75 minutes. It doesn’t matter where you are located, as a caring motorcycle lawyer I take on clients across the entire Commonwealth of Pennsylvania. A great deal of my clients live in or near Montgomery County, Chester County, Delaware County, Bucks County, Lehigh County and Northampton County. However I also have many clients in Lancaster, York, Monroe, Luzerne, Berks, Pike counties and many other counties throughout PA. If you have been in a Pennsylvania motorcycle accident call 888-292-5352 24/7 for a free consultation. Prior to becoming a motorcycle accident attorney in Pennsylvania, I received my degree in Finance from the George Washington University in Washington D.C.
Not yet knowing how I wanted to spend my career at the time, I accepted a job as a Financial Consultant with Janney, Montgomery Scott, where I stayed for approximately two years while my passion for law school began to grow. After graduating law school in the spring of 1991, I began to immediately represent people who had been involved in serious motorcycle accidents and automobile crashes. Over the years, as my law practice grew and eventually became almost 100% focused on representing bikers and their families my Pennsylvania motorcycle law firm reputation grew and I became known simply as “The Cycle Attorney”. Over the years my motorcycle accident law firm has represented members of virtually all of the local motorcycle clubs as a motorcycle injury lawyer for recovery of medical bills, recovering lost wages, and motorcycle damage from Pennsylvania accidents. This includes the H.O.G Clubs, The Blue and Red Knights, The Blue Comets, Reading Motorcycle Club, The Patriots, The Mavericks, B.A.C.A of both Montgomery County and Bucks County, The Lucky Seven, Bucks County Motorcycle Association, The Centurions and many other cycle clubs that are simply too numerous to list. Remember, motorcycle accident attorneys are here to protect your rights. I care about my clients because accidents can happen to any of us at any time. If you or someone you care about has been involved in a Pennsylvania motorcycle accident, they deserve an experienced motorcycle accident law firm to represent them. Tell them to give “The Cycle Attorney” a call at 888-292-5352 (888-CYCLE-LAW). We are always available to take your call 24/7 – 7 days a week.